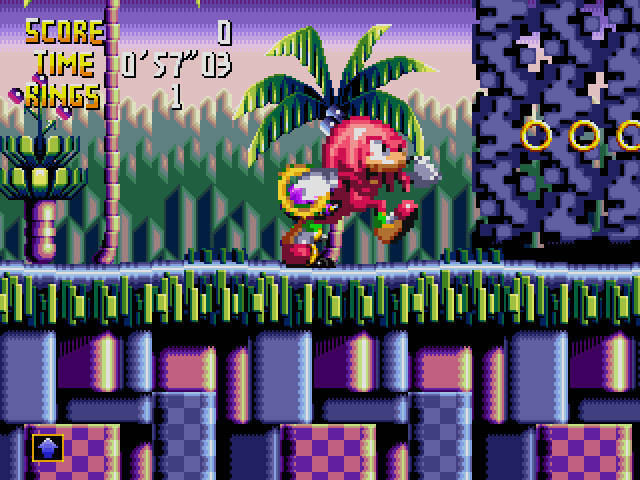 Released for the Sega 32X in 1995, Knuckles’ Chaotix is the sole title in the Sonic the Hedgehog series to grace the ill-fated add-on. It’s apt that there was only a single title on the Sega 32X since, much like the series, it went fast. Still, this game contains some stellar audio/visual qualities that seem to utilize the benefits provided by the add-on. Despite not revolving around or even featuring Sonic (outside of a cameo in the credits), the gameplay is that of a Sonic game, with one major difference. A second character remains attached to the player’s character at all times via a magical elastic ring. This was quirky and introduced unique platforming mechanics, but I bypassed it entirely by playing as another character. The game featured a comprehensive tutorial explaining the unique mechanics. 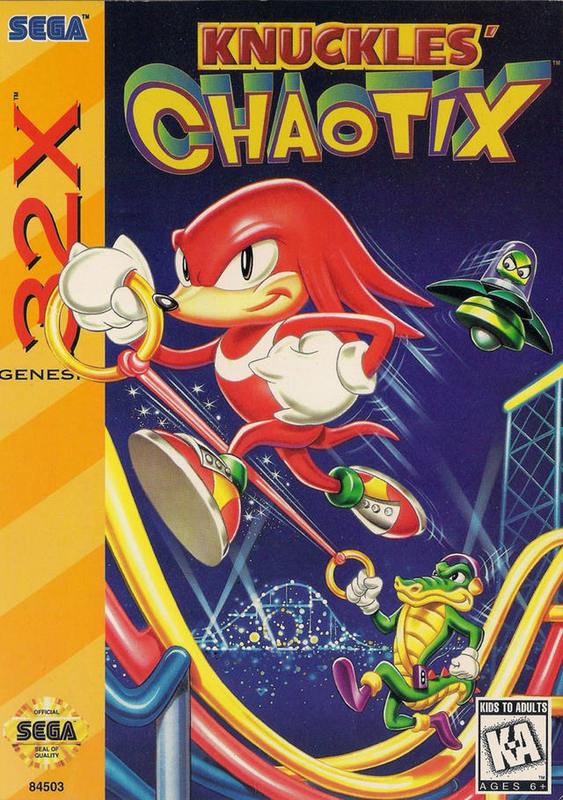 Set against the backdrop of an amusement park the day before its opening, Knuckles’ Chaotix documents the trials that the famous (infamous?) echidna and his roadies were put through in order to see its opening day go off without a hitch. Chaotix, as I’ll refer to the group, cleanse Carnival Island’s five areas of Dr. Robotnik and Metal Sonic’s evil influence and prevent the duo from obtaining some sort of all-important crystal. Like its contemporaries, this is a Sonic game that is light on narrative. Which, considering the low, weird places the series has gone since the late 1990s, that’s a good thing. As I mentioned, the gameplay veers from the series’ familiar formula in one major way: the addition of Ring Power. That’s the system that chains two characters together. It adds an additional element to the fast-paced platforming and boss fighting that traditionally occurs. Ring Power paved the way for rubber banding the characters to gain momentum and using that same concept to slingshot upwards and scale platforms. Because of this newly implemented mechanic, or perhaps in order to make it seem more necessary, stage design seemed to rely upon verticality to a much greater extent than previous games. The stage structure seemed more mazelike as well. There were times when I got confused on which way I needed to be going after doubling back many times while ascending the stages. Per usual, special stages were present and felt familiar to past games. 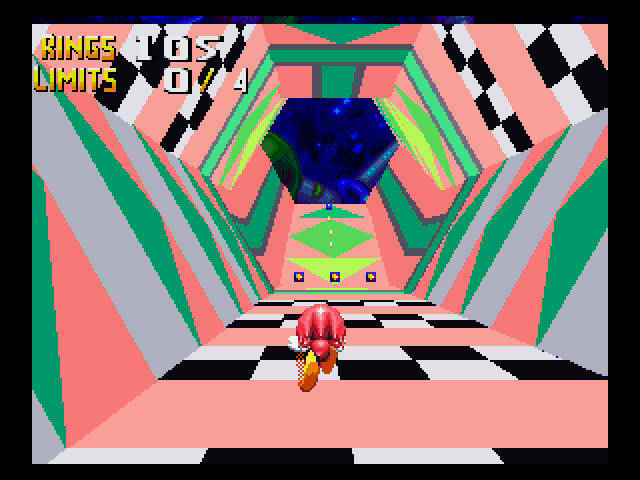 I recently read that the stage design for the Sonic games of this era was built upon the concept that the pathways on higher ground would lead to faster stage completion. These pathways contained more divided platforms and as such, allowed a smaller window of time to react, especially when zooming about at “Blast Processor” speeds. In other words, they required more skill. 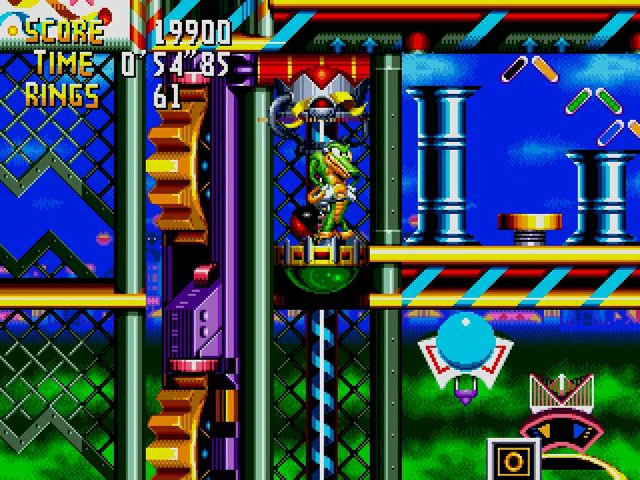 I’ve never been particularly skillful when it comes to these games, which is great since Knuckles’ Chaotix abandoned this approach. Instead, the stages felt more like those maze puzzles that have an entrance and an exit and task you with drawing a line connecting the two. When completed slowly and methodically, mistakes can be avoided but when you try to speed up, errors are made and backtracking is required. Unfortunately, this is a Sonic game and the concepts of “gotta go fast” and maze navigation don’t mix too well. There was another option however. The characters that make up Chaotix are a diverse bunch: Knuckles the Echidna, Mighty the Armadillo, Espio the Chameleon, Charmy Bee, and Vector the Crocodile. I take that back. They’re all Sonic clones with a unique move or two and they go just as fast as the “Blue Blur.” Well, except for Charmy Bee. Charmy is a bee and accordingly can fly. There isn’t an energy bar or stamina that needs to be considered either, he can just, fly. This impacted my playthrough in the following way: once this fact dawned on me I always chose Charmy and I would just fly to the exit or fly to the objective and then to the exit. Now this wasn’t a linear path I was on, I still had to navigate the confounding stages and believe me, when you ignore the actual platforms, they’re even more confounding. But, this was also the path of least resistance and I’d have been a fool not to take it. As a result of Charmy Bee becoming my default character, I barely experienced Ring Power. I wasn’t dismayed by this. I spent about a quarter of my playthrough abiding by the platforming limitations requiring its use, but honestly, nothing comes to mind, outside of switches. All I can remember are stages that went vertical and doubled back way more than they should have and the tutorial which demonstrated a few of the ways Ring Power would be necessary. I can’t think of any times it was mandatory though, besides switches. It’s a novel idea, but one whose applications inside a game such as this seem limited and the implementation here didn’t call for it, making it practically nonexistent in my experience. One of my favorite power-ups seemed to have inspired New Super Mario Bros.
I’m not an expert on the first handful of Sonic the Hedgehog games, or any really (maybe Sonic Adventure 2: Battle (Chao man, Chao! )), but the stage design on display here was confounding. The prospect of taking the series – known for its speed – and putting characters with similar abilities in positions where the focus on speed is removed in exchange for labyrinth navigation is frustrating. Not only that, but they introduced a new mechanic and in the same game introduced a character who completely nullified it, let alone require its use (disregarding switches). 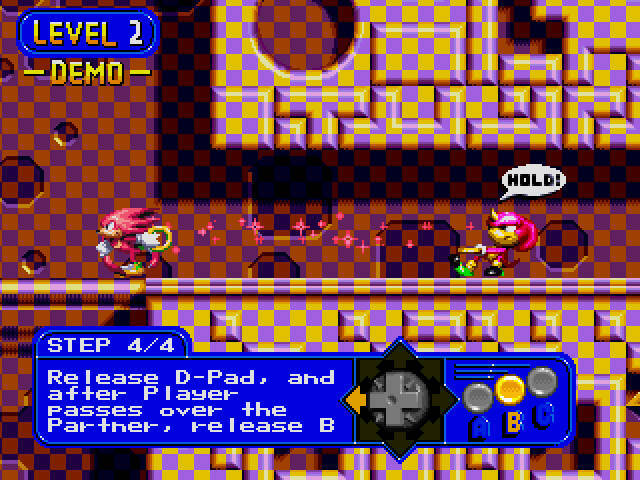 There are enjoyable moments in this game, and it’s a worthwhile addition to a Sega 32X collection because of the add-on’s small library, but Knuckles’ Chaotix isn’t worth seeking out otherwise. And… all the way down here is the link to my collected let’s play where you can witness firsthand my opinion of this game form. I hadn’t settled on whether I’d buy this or “The Witcher 3”, but your review has tilted me in Knuckles’ favor! I’m kidding, nice review – I just realized I’ve never read a review of a game that came before 2005, with the exception of Ocarina of Time for the N64. I’d definitely like to see more of these. Next up you ought to read my review of Metal Gear Solid so I can sway you to play it instead of The Phantom Pain! I like playing older or obscure games (newer ones too!) and writing about my impressions afterwards. Stick around and you’ll find them from me. Thanks for the like and comment! Don’t mention it! And I’ll be sure to take a better look at the other things you’ve published tomorrow, once I have some time. I talk all things (PC)gaming on my own website, if you’d like to check it out, and show some special love to the indie side of gaming. I’d appreciate it if you took a look! I can tell; your writing is prolific! I just read your Papers, Please review and that gives me one more reason to fire it up. Seems like such a unique, mature game. Thanks! It was one of my earlier reviews so I personally have some issues with it. I was rusty and still settling on a comfortable content x form relation that didn’t make reviews into a droll-fest but still kept them informative. The developer, Lucas Pope, really has some interesting games, though he seems to have parked in that “bureaucracy simulator” niche he started with Papers, Please. I can’t wait to see more of his upcoming game, Obra Dinn.